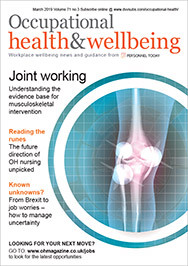 Work can make a positive or a negative contribution to health, according to consultant Greta Thornbory. Yet OH staff are not always seen as an essential part of a health and safety team, although the disciplines are inextricably linked. Practitioners must be prepared to advise the members of their organisation who have responsibility for health and safety, including HR, managers, unions and safety personnel. This requires an understanding of team working, leadership and negotiation skills, and continuing professional development. Chartered physiotherapist James Bowden, of COPE OH and ergonomic services, explained how good ergonomics keep people feeling normal and prevent work related problems. It involves a continual search for compatibility between staff and the workplace, and OHNs must engage with management to influence that model, he added. Judith Howard-Rees, director of Gipping Occupational Health, presented a drugs and alcohol case study. She reminded delegates that in some instances, employers could be breaching the Human Rights Act if they introduce random alcohol testing, so OH must first check the legal situation before agreeing to such measures.